By BuckBilly, July 22, 2009 in General Talk - Anything Goes! That's what I like to see!!! Good Morning to you too!!! Waky Waky......time to make the dohnuts!!!!!!! Eat chilli with beans, put covers over your head before you go to sleep. That will wake you up in a hurry!! Good Morning and Happy Monday!!! How I feel right now!!! Good Morning. I saw this article on Motosport and thought it was pretty good. Anyone add anything? You might think hopping on-board an ATV and going for a spin is just as easy as taking your regular 4-wheel car for a ride around the block. After all, both have four wheels. How hard could it be? In many respects, you're right. 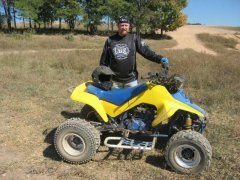 Some adventure riders choose quads over their two-wheeled counterparts of the dirt because there's less chance of crashing and it's easier to learn. ATVs also offer more manageability for younger riders to get acquainted with outdoor riding than a dirt bike. 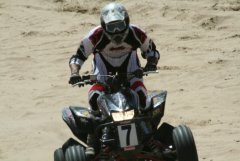 However, beginner riders on ATVs tend to make the same mistakes that result in crashes, roll overs and injury that could be avoided with some instruction and know-how. 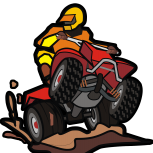 If you're looking at a fun family outing by renting ATVs or want to get into the sport take advantage of the following points and avoid the same mistakes so many other first time ATV riders make that end their day early or before they barely get started. Believe it or not, it's fairly easy to roll an ATV over. And you don't want to be on the bottom of that sandwich. The most common way of ending underneath a quad is looping out. That's done by hitting the gas and having little to no experience with the power of an ATV. The front spikes up like an out of control stallion, throws you onto your back like a bucking bronco and then pins you like a UFC Champ. The second way is when you're having a bit too much fun sliding around in mud or other slick conditions, the tires finally do what they're designed to do and grip the ground but the rest of the bike, with you on it, keeps going. Finally, those who think they've found their bearings take aim for a steep slope and try to conquer it only to end up upside down or in their attempt to arch alongside said steep hill, tumble over the side. This goes somewhat hand-in-hand with the roll over capability that many riders fail to appreciate therefore they also neglect wearing proper protective equipment. Don't think wearing jeans, t-shirt and sneakers is adequate protection when riding a 4-wheeled machine powered by a gas engine that doesn't have seatbelts. You need a helmet, goggles, gloves and riding boots at a minimum. Once you start ripping it on the track or trails add a chest protector, neck brace, knee brace, etc. Everybody wants to skip the kiddie stage and get right into hair-raising speed when it comes to riding ATVs. OK, most everybody. But for those who do so many put on the cloak of invincibility and think a quad is merely a mini car that finally enables them to release all sorts of pent up childhood inhibitions. So they jab their thumb into the throttle with the expectation of a controlled roller coaster ride. Instead, they loop out and end up underneath the quad or manage to stay seated only to careen off course and introduce their 4x4 to a large tree. ATVs normally have a thumb throttle and most have an automatic clutch so the clutch is one less thing to worry about. So go slow and figure out how much "thumb" is too much and get used to the speed and power an ATV delivers before really going for a ride. Oh, one more thing, learn to take your thumb off the throttle! Never, ever ride an ATV up a ramp into the back of a pick-up. If you want to know why just go to YouTube. 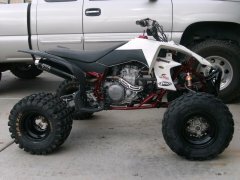 If you want to know how to load an ATV check out this fine piece of quality information on How to Load a Motorcycle, Dirt Bike or ATV into a Truck. The bottom line to riding an ATV the first time is treat it like you would anything that comes with a modicum of danger. Careless behavior endangers you and others but with common sense and a willingness to learn you'll enjoy of lifetime of riding quads. as many might know, the years previous, California had drought conditions that allowed "bark beetles" to basically kill many evergreen trees. I live in Vancouver Washington but don't have many riding options so I head to Bend Oregon there is a ATV park called East Fort Rock that offers 315 Miles of trails. I have flexibility to ride during the week (which I prefer) rather then weekends if anyone wants to ride let me know I can be reached at [email protected] it is about a 3hr drive but I don't mind making it as long as the Government Camp pass is not snowing or iced in.